Stress less while living more! An inviting living space. Time spent with loved ones. Peace of mind. With Do Less, a happier, more serene life is just moments away. From your home to your finances, this straightforward guide teaches you how to scale back your possessions and commitments to just what you really need. With hundreds of ways to minimalize your life, you'll quickly uncover the joys and rewards of paring down. 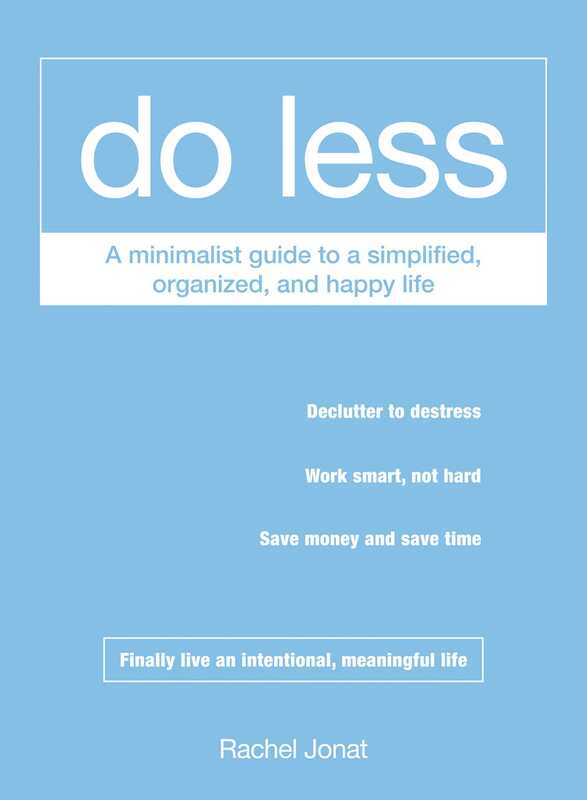 A must-have for any shelf, Do Less helps you rediscover the simple moments that have been buried beneath the piles of to-dos, to-knows, and to-buys. Rachel Jonat is the author of Do Less: A Minimalist Guide to a Simplified, Organized and Happy Life, The Minimalist Mom: How to Simply Parent Your Baby, and The Joy of Doing Nothing. A sought-out expert on minimalism and simplifying, she has been featured on television and radio, The Globe and Mail, Babble, and Business Insider. She lives in Vancouver, Canada, with her husband and three sons. You can read more of her work at her popular blog TheMinimalistMom.com.